I’ve touched on this story before, but a few years ago Ella and I were in Marseille for my birthday. For lunch we headed to an authentic (read ‘basic’) little Moroccan restaurant near the old port. We’d heard rumours that their chickpea stew was rather excellent and it was prominent on the menu. Ella chose it and wished she hadn’t. Down in the rich depths of spicy sauce was something unpleasant: a large lump of lamb. It wasn’t the most fortuitous of days for Ella: a harbourside gull also gifted her a ‘lucky’ present on her head. Thankfully, the experience hasn’t scarred her and we’ve not been put off chickpea stews. But then, how could we be? We make variations on them every few months. Indeed, there’s one we tried earlier here. That was my version. This is Ella’s and it bears much closer comparison with the heady, rich, deeply flavoured and rather unctuous bowl served up in Marseille – minus the ropey ruminant. In my book, Ella’s is better than my own version, though some might prefer the lighter one we featured earlier. Try this though, it’s lovely. For a couple of big portions: finely chop one medium onion and fry in a little olive oil on a medium heat in a large stockpot or saucepan. As the onion starts to turn golden, add 2 small or 1 large bell peppers, cut into strips no wider than 1cm. When the onions and peppers have softened add the dried spices: a dessert spoonful of cinnamon, a teaspoonful of paprika, a little ground chilli, and a dessert spoon of ground cumin. It might sound like a lot of spices, but it’ll take it. Stir in the spices to coat the veg. As they soak into the softened veg and oil they will create a kind of paste. To this add a good squeeze of tomato puree. Stir again and ‘cook out’ the paste, heating it through in the pan for another five minutes, stirring occasionally so it doesn’t burn. Next, add a large handful of small waxy potatoes, halved or quartered so that they’re chestnut sized. Then add two tins of chickpeas. Stir in the potatoes and chickpeas and then add around 750ml of vegetable stock – enough that the liquid comes a couple of centimetres or so above the vegetables. Bring the stew to a boil then simmer for around 30 minutes until it has reduced and thickened a little. The longer you cook it the better it will get, so leave it longer if you like but don’t let it get too thick. As it’s cooking, add a good dessert spoonful of dried mint. Season with salt and pepper and add some more cinnamon, cumin and mint if you think it needs it. 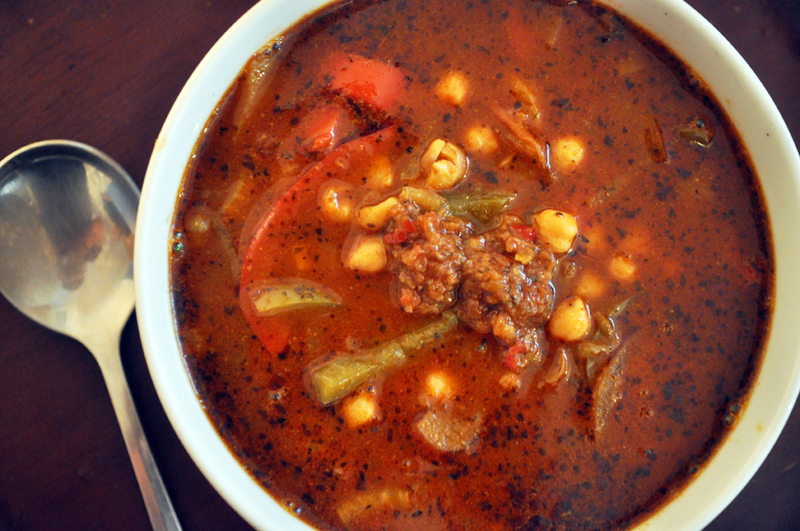 Remember, a richly aromatic, deeply spiced stew is the intention. And that’s it – except for for the vital topping of chilli sauce: with a large mortar and pestle grind up a clove of garlic, a few fresh red chillis and a dash of cinnamon together with a little olive oil until you create a fiery sauce. Serve this at the table alongside the soup and add as much as you dare. I could eat this every day and the world would be a little bit of a better place. A rather delicious bowlful of soup from Ella, who will often pep up a tomato-based Italianate recipe with the addition of some basil leaves, garlic, and olive oil, pounded with a mortar and pestle. It’s a good trick and produces something akin to pesto, but with a bit more tang and a little less gloop – great to have a spoonful with some soup. Essentially, this is hearty one-pot stuff, taking an onion, garlic, chilli, pepper, courgette, tomatoes, a tin of butter/borlotti/pinto beans, and some stock and bringing them all together. So, in a large, deep saucepan or stockpot, fry a sliced onion for 5 minutes until soft, then add two cloves of chopped garlic and some fresh chilli (as much as you like). After 2 minutes add a sliced bell pepper, seeds and pithy bits removed. Cook for 5 more minutes then add a roughly diced courgette. Stir. Then add either a tin of chopped tomatoes or 4-5 medium tomatoes, skins removed and chopped. Stir again then add a litre of vegetable stock or water. Simmer for as long as it takes for the liquid to reduce and the soup become, well, soupy. The longer the better really as the flavours increase with time on the hob. Serve with the basil ‘sauce’. I think that’s how Ella made it, in any case. 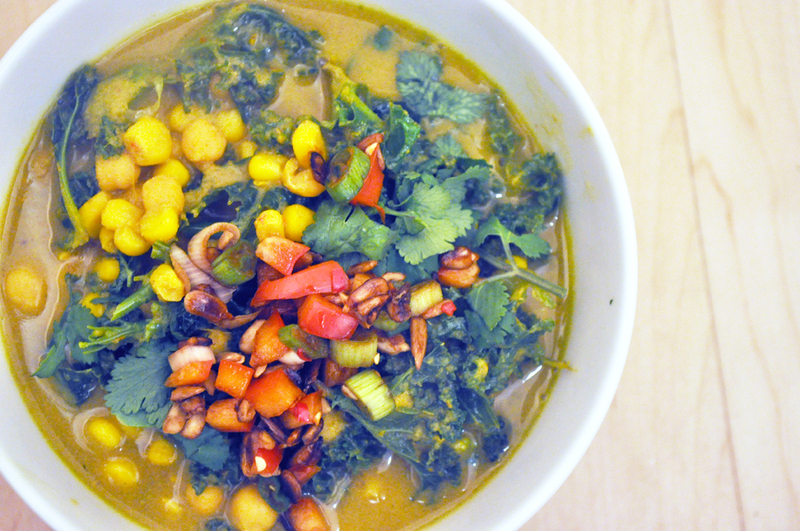 And one final thing, we did already allude to this soup in an earlier post, here. Which leads me to say that yes, this is our weekday variation. I know, we’re playing catch-up here, but we have an excuse. We’re moving house you see, and for the past few weeks I’ve been calling solicitors and estate agents every hour, every day. The good news? We’ve exchanged contracts and are looking forward to moving in a couple of weeks and starting to shop for our veg at the wonderful little local grocer’s. Of course, we are still eating. Back in May, Ella got me Denis Cotter’s briliant new recipe book For the Love of Food. You can get it here. This rich, rustic, wonderful soup is one of the first recipes we’ve tried from the book. As ever with Cotter, the trick is in assemblage. What? Well, Cotter’s talent is to see that you should treat each ingredient with the respect it deserves. 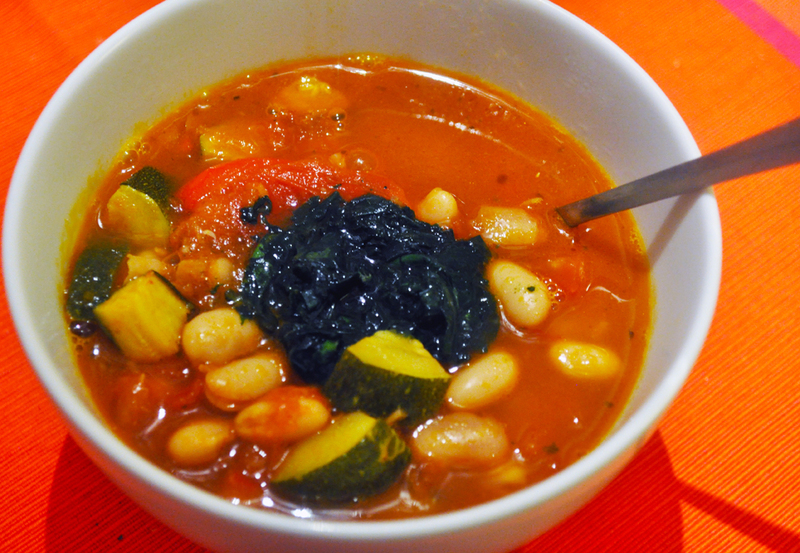 If I’d invented this summery soup I’d have probably fried an onion, added some courgette and peppers, then added a tin of tomatoes and a tin of borlotti beans, some chopped chilli, a pint of stock, simmered, and then scattered some basil leaves over at the end. And, you know, fine. Seriously, it would be fine. The Cotter factor? Roast the peppers first, cook the beans separately and add marjoram and the zest and juice of a lemon. Add some spring onion at the end. Blend wilted basil leaves with olive oil and chilli to make a fiery pesto. Et cetera, et cetera. 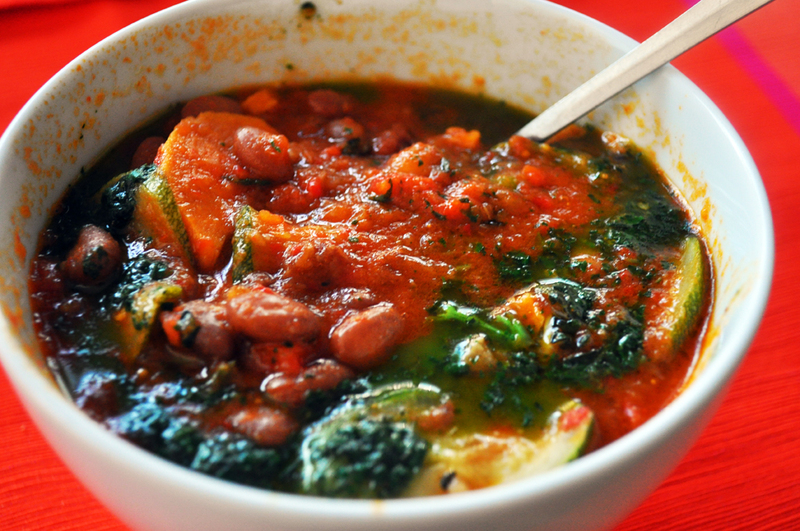 The end result is a much deeper flavour and a soup that is truly respectful to the vegetables from which it is made. Glorious. 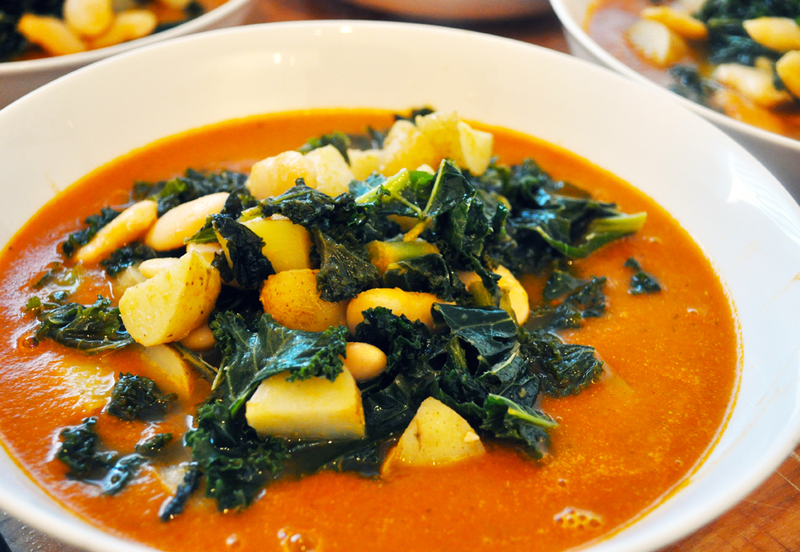 I think you could change the vegetables for this – some of them at least – as long as you stick with the potatoes and chickpeas, which do a good job of soaking up some of the flavours and making it more stew-like and slightly less soup-like. However, at the risk of contradicting that last statement, the stew should be ‘loose’, watery, broth-like and not thickened, just reduced slightly to intensify the flavours in the broth. 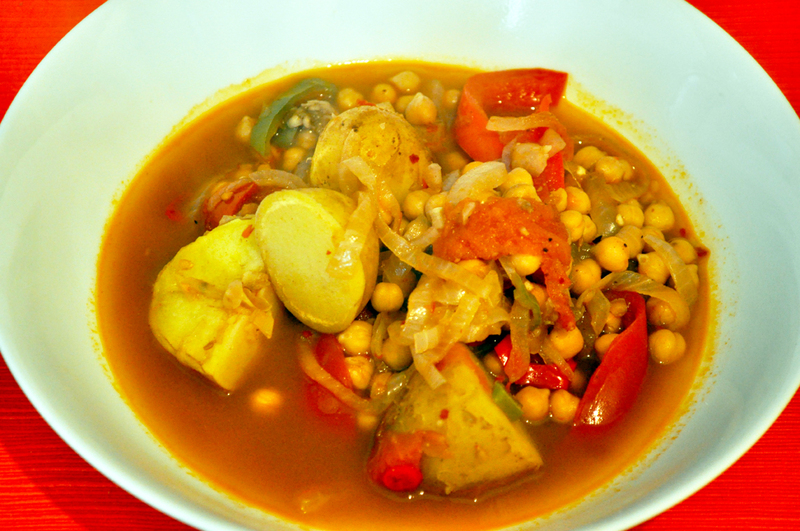 This is a recreated version of a dish we first ate not in Morocco but in a local Moroccan restaurant in Marseille. Maybe there’s an Algerian influence, then, but I’m not sure. There was a sweetness to the broth that told us there was more going on in the spices than just cumin or coriander. It took us a while playing around with different mixes before we got this right – oh, and a trip to Morocco where we had the chance to talk to domestic cooks about the spices they used. And so, our Moroccan spice blend is a mix of chilli powder, cumin, slightly less coriander, a touch of paprika… and then a dash of cinnamon, allspice, a clove or two and possibly even a couple of cardamom pods, seeded and crushed. You could even add some ground, dried rose petals. Bart, the spice company, does a tin of Berbere spice mixture that covers this off pretty well if you don’t want to mix your own. Have a look, here. For this recipe, I’d suggest around 2 level dessert spoons of spices in total, but you might want to alter that depending on how spicy you like it and how spicy your chilli is in the mix. Peel and finely slice a large onion and soften it in a little olive oil for 5 minutes in a large frying pan until translucent. Deseed and roughly chop one bell pepper (any colour you like) and add to the pan. Next, take a handful of smallish new potatoes per person, wash ’em, peel ’em if you like, and chop ’em in half. Add to the pan and stir. Next, tip in a tin of chickpeas and stir again. Add a couple of chopped fresh chillis (go on, be a devil), then your spice mixture, then three medium fresh tomatoes, roughly chopped. Finally, add 500ml or so of water, season with a little salt and pepper, and simmer for around 20 minutes until the potatoes are soft (you should be able to break one with the back of a spoon). So, to recount, what you’re aiming for is a loose stew of mixed vegetables and legumes in a fiery but fragrant, tomatoey broth. Hopefully you’ll get a bit of a sweat on while you eating it, but still want to lap up more of the sensitively spiced flavours. A couple of slices of Turkish-style bread would be good to mop up the broth. Phwoar. I think a lot of British people associate paella with being a seafoody dish, probably because of summer holidays on the Spanish coast. In fact it’s originally a regional dish from Valencia and, over time, has been made with almost anything that you can throw into a pot – snails, rats, pork, chicken and, yes, seafood, as well as a whole host of vegetables. 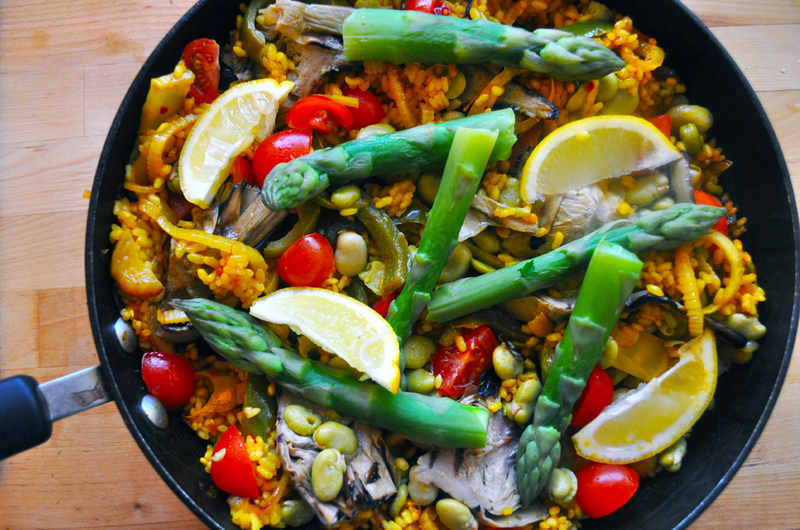 Peppers, butter beans, artichokes and cauliflower are all popular additions to a paella. Ours tends to change with the seasons. In winter, a paella with cauliflower, peppers and butter beans is a fantastic thing. This spring, I threw the some of the contents of our seasonal veg box at it, plus a few other bits and pieces from the fridge. Not exactly traditional, perhaps, but then dishes like this can be varied ad infinitum. A paella differs from a risotto in that, as the rice is cooking in its broth, you don’t stir it. There’s no sauciness to a paella, it’s a much drier dish than a risotto and so more closely resembles a biriani. Indeed, an authentic paella – especially one cooked outdoors over charcoal, will develop an almost crispy layer of rice at the bottom of the pan. Oh, and you need to use either calasparra or bomba varieties of rice or it won’t work. Our version this week? Sautee a finely sliced onion in olive oil in a wide, shallow pan until it is golden and soft. Add a thinly sliced bell pepper to the pan (seeds removed of course) plus a clove of garlic and cook for a further five minutes or so. Add the bomba or calasparra rice and coat in the olive oil. Add a generous glug of sherry or white wine, or a splash of sherry vinegar of white wine vinegar. Cook for three minutes. Now add a good pinch of saffron strands, a large teaspoon of paprika, a small teaspoon of smoked paprika and half a teaspoon of turmeric. Oh and a bay leaf. Stir in the spices to coat the grains of rice. Add hot water until it comes up a centimetre or so above the rice. Turn down the heat slightly and leave (really, don’t touch it!) until the broth has been absorbed. When it’s done the rice grains should have a pleasing sheen to them and be individual, separate, glistening grains and, while cooked, not puddingy. It will take about 20 minutes. While the rice is cooking, lightly steam a few asparagus spears, refresh under cold water and set aside. Then blanche and shell some broad beans. As the rice nears the end of its cooking add the beans and some (tinned – they’ll be fine) artichoke hearts. Be careful not to move the rice around to much as you add the veg. They just need to be warmed through, that’s all. When the rice is cooked add some quartered cherry tomatoes, wedges of lemon (squeeze them slightly into the dish) and place the asparagus spears on the top. Serve. We always make too much of this and are quite happy to eat the remainder the following day. It works really well. As for quantities, I’m going to talk about recipes and quantities soon, honest. A very simple thing this, made mainly because we had some globe artichokes, courgettes and an aubergine delivered to us in our weekly box of veg. I’m lying ever so slightly, however, by calling it a grilled vegetable salad because in this instance we roasted the veg. Char-grilling would be better, but a barbecue isn’t possible here at ETP Towers at the moment. Whichever way you choose to cook – and sweeten up – the courgettes, aubergine and some peppers, the idea is to combine them with artichoke hearts, cherry tomatoes and mozzarella like a big platter of vegetarian antipasti. 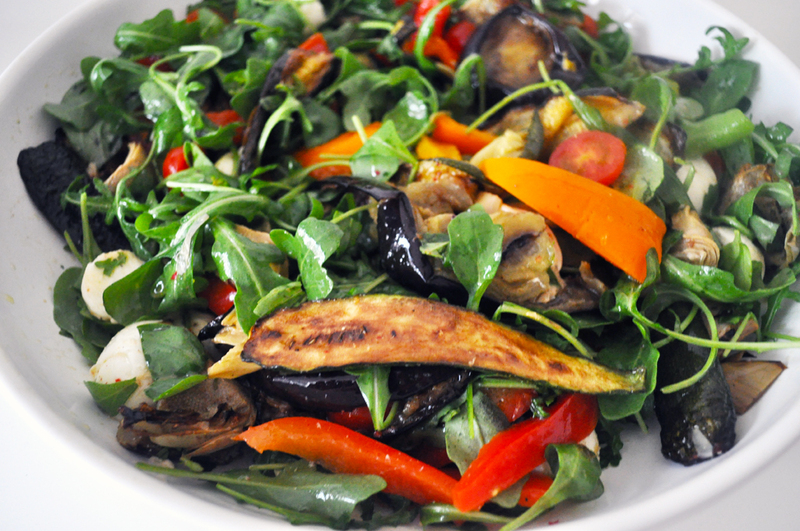 Rocket and some torn basil leaves makes it a salad – perfect for a lemon and olive oil dressing. You could also add olives and maybe even some capers. …yesterday’s lunch, actually. Ella made a Thai salad with some lovely Asian baby salad leaves, shredded white cabbage and Chinese leaf, pepper, herbs and chilli. 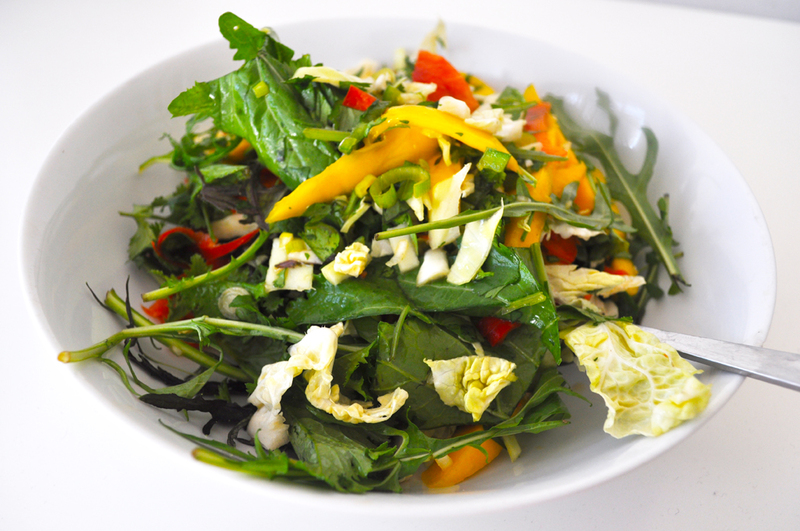 The salad is pepped up with a dressing made with lime and lemongrass. Love it – and eating al fresco on the balcony is always a winner. Last night’s dinner really was last night’s dinner. We had plenty of our Savoy Cabbage, Chickpea and Fennel stew left over from Monday… so, what to do with it? Slice some new/salad potatoes into 5mm discs and sautee in olive oil until tender – you might need to put a lid on the pan so they half fry, half steam (BTW, potatoes and olive oil? Yes please!) Then add yesterday’s stew. The result was less loose than the previous day’s as the potatoes soak up the juices nicely. We’ve not tried this before but will do it again. A success.